THE PSU BIKE CHALLENGE IS HERE! The PSU Bike Challenge is happening May 1-31 and you're invited to take part! The Challenge is a fun, free team based competition. There are lots of fantastic prizes being offered to tempt you and your team get out and ride this May. Will your team beat the other University departments and teams to come out as champions!? Departments and schools compete against each other to see who can get the most students and staff to ride a bike and log their trips between May 1st-31st. For 2019 we are using a points model that ensures equal opportunities for teams to compete regardless of their size category. The points system has been carefully selected to ensure a fair and exciting competition, and to strongly encourage students and staff to engage new riders if they want to climb the leader board and secure victory! 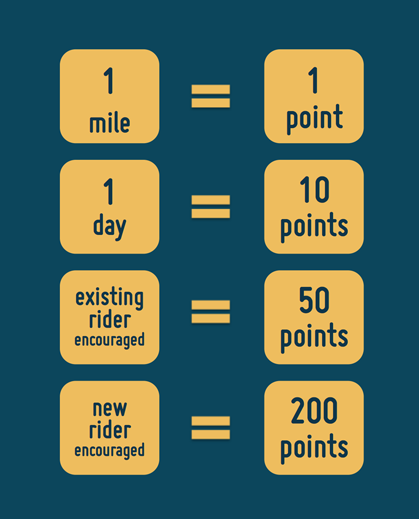 Users get points for mileage, number of days ridden, and number of people encouraged. Here's how you get encourager points: when someone signs up and logs their first ride for the Challenge a prompt pops up and asks them to identify whether someone in particular encourage them. If they identify you as their encourager, then you get points! Why sync with Ride Report? It logs your rides automatically! No need to press start or stop. Through the magic of technology, the app knows when you’re riding your bike and automatically logs your rides. Automatically go into our prize draws - Not only do you automatically share your data, but by syncing with Love to Ride you also automatically get entered to win prizes! Ride a bike anywhere, anytime between May 1st and 31st. Team sizes are based on the department or school representing them, but everyone has an equal chance of winning great prizes. Sign up today!